Apple always strives to bring the best technology to people. iTunes Store is a online digital media store operated by Apple. I'm simply amazed with the way it works, the interface is so well organized, that finding an item you are looking for is no longer an issue. The items are spread across various categories like Music, Movies, Apps and Podcasts... which in turn have subsections. Movies can be purchased or rented from the same day the DVD's are released in the market. The files downloaded from the iTunes Store can be used on up to 5 computers which should be authorized to your iTunes Store account. That's a nice way to prevent piracy. The App Store is the best part of the iTunes Store. It has a collection of over 3,00,000 apps which can purchased or downloaded free(free apps) of cost. These apps are supported on iPod Touch, iPhone and iPad. Apple products have always garnered attention for being innovative, efficient and reliable. iTunes Store is popular in countries like US, Canada, UK, Japan, Australia, Korea and some more, but haven't yet entered India with a full fledged store. Indian iTunes Store has an App Store with limited number of apps available as compared to the US app store. However, Apple is constantly expanding the iTunes Store to accommodate the increasing customer base and their needs. 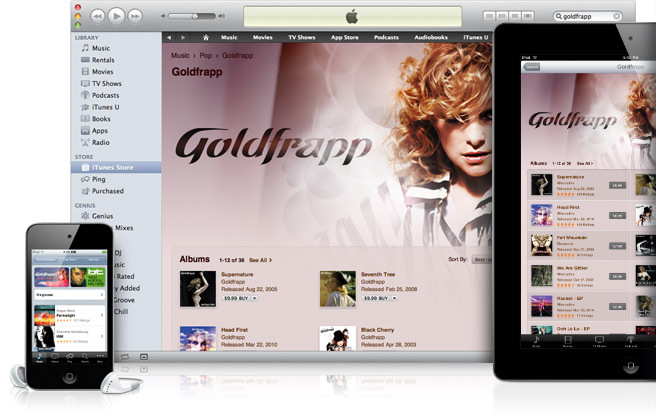 You can access the iTunes Store online or by downloading the iTunes application on your computer from http://www.apple.com/itunes.